BarCamp Prishtina started the new year with another interesting edition that comprised of a set of interesting speeches and intriguing stories for the audience. The already-established community consisted of zealous people, who seek to innovate and develop themselves both in academic and professional terms, as well as first-time attendants of BarCamp. The main theme of the twenty-eighth edition of BarCamp Prishtina was Astronomy, which is the study of celestial objects such as stars, galaxies, planets, moons, asteroids, and comets, the physics, chemistry, and evolution of such objects, and phenomena that originate outside the atmosphere of Earth. The main purpose of this theme was to generate discussions on astronomy and make participants aware of the opportunities that are prevalent in Kosovo in terms of engaging in astronomical activities such as observations and analysis of celestial objects. 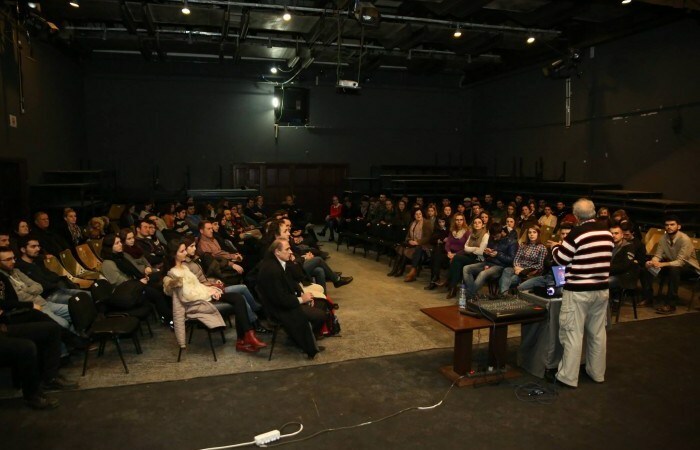 Three speakers were invited in this edition of BarCamp Prishtina, consisting of Rasim Bejtullahu, Sylejme Gogolli, and Pranvera Hyseni. All of them provided their insight on the way they have been involved in astronomy and the current situation of this subject in Kosovo. This edition of BarCamp took place at the Oda Theatre, an area that provides a decent environment in which people can gather, socialize, share ideas, and prosper. Interesting talks and discussions engaged the participants’ minds, while fresh drinks kept the former receptive to ideas and thrilling discussions. The interest was extremely high, as it aids our attempts of increasing our BarCamp community and provide them with opportunities of personal and professional growth, as well as serve the objective of BarCamp by inspiring them to take on ideas and implement them. Rasim Bejtullahu, Professor of Theoretical Physics and Astronomy at the Department of Physics at the University of Prishtina, proposed and placed Astronomy in the University’s study program. Professor Bejtullahu offered his insight on the current situation of Astronomy in our country. Furthermore, he emphasized the importance of Mathematics in the development of Astronomy, since the latter cannot be adequately pursued without proper knowledge of the former. The Professor also pointed out several problems that hinder Astronomy, specifically the lack of Albanian terms and the lack of a scientific journal, which would contain important information on the subject. Sylejme Gogolli, Professor of Physics and Astronomy at “Eqrem Çabej” Gymnasium in Vushtrri since 1988. In collaboration with high school students, Professor Gogolli established a scientific group called “Young Researchers” (Hulumtuesit e Rinj) in December 2006. She talked about her experience in education, the projects and seminars that the club has been involved in, as well as the hard work that the students have put in. Pranvera Hyseni, a second-year student in the Department of Geography at the Faculty of Mathematics and Natural Sciences, founder of the Club of Amateur Astronomers of Kosovo, and Chair of “Astronomy Outreach of Kosovo,” talked about the way she got interested in this subject and her achievements so far. She also encouraged the audience to take part in observations and events that are organized in Kosovo. A coincidental occurrence of this edition of BarCamp was the fact that the speakers had actually known each other prior to BarCamp, as Pranvera was a student of Professor Gogolli, while the latter was a student of Professor Bejtullahu. Hence, it was quite nice to see the outcomes of the positive impact that they have had on each other. The audience was very interactive and discussions were raised on the current state of astronomy in Kosovo. Some participants also made sure to offer their ideas in regards to the Professor Bejtullahu’s comments on the relationship between Mathematics and Astronomy. In addition, a member of the audience, specifically Leutrim Panxha, had an idea that he shared with the audience. He made them aware of another opportunity, NASA Space Apps Challenge, where all interested individuals can apply. Since BarCamps offer people a place where they can all share ideas and interesting personal stories, this BarCamp definitely provided a comfortable environment in which everyone can prosper. Another great edition of BarCamp Prishtina has come to an end. It resulted to be the best way to start the new year. Until the upcoming edition of BarCamp next month, socialize, collaborate, inspire, and innovate! See you soon in BarCamp Prishtina #29.